We would like to thank you for the opportunity to allow us to work with your children and be a part of their lives. I must tell you that it is only a privilege to be in their presence. Every instructor and volunteer considers each child as their own and takes personal interest in their growth. As people of change, we want to constantly assist in the development of skills related to being a better human being, to present themself impeccably in front of people, have a well - grounded and rounded personality, build strong morals, emotional, physical and mental development, and confidence. Of course, dance and theater is a medium we use to develop these skills. Research has also shown that dance also help build concentration, mind - body - emotional coordination and focus. Our dance classes are designed not only to teach various dance forms to children and introduce new styles, but also to have fun, and find a way of introducing play and work together. The classes work towards understanding and noticing their developments and improving upon them. We have a presentation towards the end of the programs to ensure that the children find a platform to use these skills in creative ways and present them in front of the audience (which is you) through dance and theater. It is a blessed experience to see them perform on stage and see them find wings and we constantly hope and pray that when they grow they will find the same spaces in their lives where they will constantly learn, and build on their inner skills. Apart from providing theater and dance education to children we also do other things. We are constantly posting audition details and other opportunities online. You can keep in touch with us by logging onto www.facebook.com/dreamscoper and liking our page. This will ensure that you will be posted with all our activities. We would really like our parents to take charge, be informed and work with each other and us. To form a strong network where as a community we can communicate, engage and help our children grow positively. For this we have started an only group on Facebook called "Dreamscopers" which you can join. You can also post comments and feedback to videos we post constantly so the children and parents can learn. You can know more about us at www.dreamscopetheatre.com. Speaking of which, I would like to know more about you as well. Your aspirations for your children on a personal,and emotional level, your feedback on our classes and how we can combine both to enhance our classes. 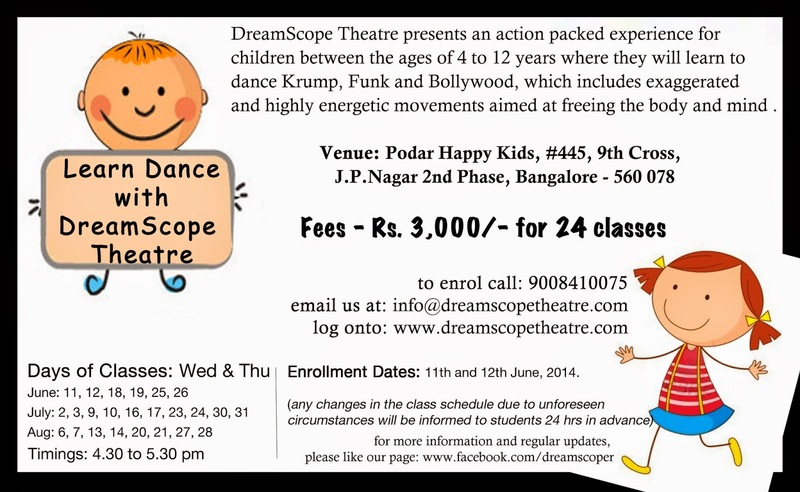 I would also like to inform you that DreamScope Theatre is starting its dance classes at HSR Layout, J.P. Nagar and Jayanagar. The fees for the classes are Rs. 3,000/- for 3 months (24 classes). The details of the classes are provided in the flyer I have enclosed. You can enrol your children by just dropping in an email or calling our number and registering. The fees can be paid on the first two days of class. We enrol only 15 children in each class to ensure individual attention. Do call in and book a spot for your choice of area and will make a note of your enrollment. The details of the classes are enclosed as a flyer in the post. Dreamscope, its team members would like to thank you for your continued support, love and affection towards our work. We will always be reachable to you on +91 9008410075 or you could email us on info@dreamscopetheatre.com with your queries and feedback, and be assured we will respond back.